Several years ago Ellen Kohl (a Ph.D Student I work with) and I started to collaborate with an incredible group of community activists called the Newtown Florist Club who live and organize in Gainesville Georgia. 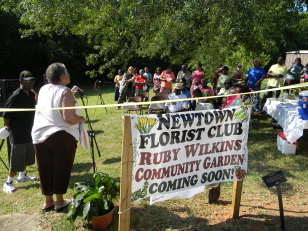 The Newtown Florist Club is a social and environmental justice organization who will be celebrating their 63rd Anniversary this year and are directed by a truly amazing woman named Ms. Faye Bush. Together, with a group of other academics, lawyers and a couple environmental engineers, we formed of a research/writing collective that we called the Newtown Florist Club Writing Collective (NFCWC). We formed the NFCWC out of concern that too often scholars parachute into communities to “research them” and just as quickly disappear. We have worked hard over the course of these years to build trust and get to know each other and hope to share our collective insights through a series of publications we are working on. The first publication from this collective endeavor has just been published in an exciting book edited by Rachel Slocum and Arun Saldanha titled Geographies of Race and Food: Fields, Bodies, Markets. “Peas and Praxis: Organizing Food Justice through the Direct Action of the Newtown Florist Club”. Beyond this collective effort, Ellen is also working on her dissertation is close collaboration with the NFC. Stay tuned for her great project in due course.